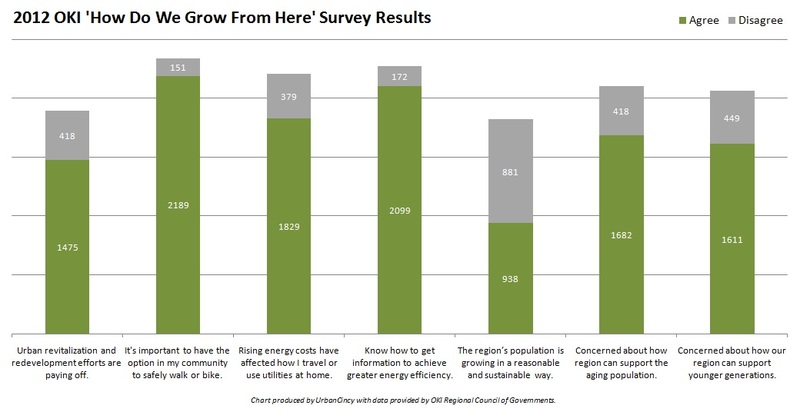 The OKI Regional Council of Governments has released the findings from its 2012 How Do We Grow From Here survey, and is reporting a record response. According to OKI officials, the survey received 2,474 responses and more than 1,200 comments. In the past, the organization had received around 100 responses for similar surveys, but was hoping for higher numbers this time around due to a larger outreach effort. The survey is intended to take the pulse of the Cincinnati region with regards to regional vitality, sustainability, and competitiveness with a special focus on land use and transportation policy. The results of the survey are then intended to be used when updating the metropolitan planning organization’s Strategic Regional Policy Plan (SRPP), which was last updated in 2005. Of the survey’s 21 total questions, seven offered particularly revealing insights into the psyche of those from around the region concerning transportation options, economic development strategies, and land use policy. The survey results indicate a clear preference for sustainable and urban communities. Approximately 60% of respondents said that they felt urban revitalization and neighborhood redevelopment efforts are paying off, and a whopping 88.5% said that it is important to have safe pedestrian and bicycling options in their community. While the 2,474 respondents stated that they wanted to see existing infrastructure maintained and their communities built in a way to support walking and bicycling, it does not appear that they feel the region is heading in that direction. More than a third of those responding said that they feel the region is growing in an unsustainable manner, and more than two-thirds expressed concern about how the region’s housing, transportation, healthcare, and recreation options will support aging individuals and younger generations that desire walkable urban communities. A 2011 report from Transportation For America found that more than 64% of Cincinnati’s population between the ages of 65 and 79 will have poor transit access by 2015 – ranking the region as the 17th worst out of 48 regions with 1-3 million people. When asked about energy and the climate, approximately 74% said that rising energy costs have impacted their lifestyle choices surrounding transportation and utilities. With nearly 85% of those same respondents feeling confident about knowing where to go to get more information or help to achieve greater energy efficiency, it appears that organizations like the Greater Cincinnati Energy Alliance are making a positive impact. OKI officials state that while they currently have no authority, and seek no authority, over local land use decisions, they hope that the results of their updated SRPP will bring about more consistency between local land use planning and regional transportation planning. On episode two of The UrbanCincy Podcast we discussed the issue of transportation poverty facing Cincinnati’s aging population, and how unsustainable development patterns are hurting the region’s environment and economy. You can stream our bi-weekly podcasts online for free, or download the podcasts on iTunes.